Zombies, Run! is coming to your Tabletop – Zombies, Run! 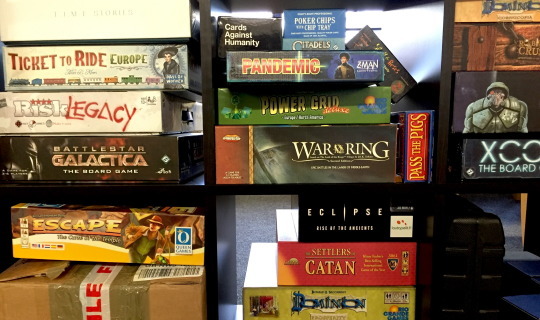 Walk into the Six to Start offices, and you’ll be confronted by a literal wall of boardgames – everything from crowdpleasers like Settlers of Catan, Pandemic, and Power Grid to more modern games like Robinson Crusoe, XCOM, TIME: STORIES, and Tajemnicze Domostwo (aka Mysterium). A great boardgame is a special mix of gameplay, storytelling, and social interaction. We’ve wanted to create a tabletop game for a long time – some of you might remember our Nova: First Contact prototype that combined NFC cards with networked phones and tablets. Last year, we decided to take the lessons learned from that prototype and create a Zombies, Run! tabletop game, with Matt Wieteska (ZR Audio Director and Radio Abel writer) as lead game designer. We can’t wait to share more details about the new game. It takes everything you love about Zombies, Run! – from its compelling characters and audio-driven story to its unique mixture of the physical and digital – and brings it to your tabletop. It’ll be an amazing experience for every Runner 5 out there – and for all the non-runners in your lives as well. Our idea is so amazing, in fact, that it convinced the UK Games Fund to award us a grant to develop a prototype! We’re very grateful to the UK Games Fund and the UK Government for this opportunity. This program is a fantastic way to support UK game developers like Six to Start, and a massive vote in confidence in our project. We couldn’t be more proud of the work we’ve done so far, or more excited to show it to you all when it’s ready. We’ll post updates about the game to this blog, but to hear all the news, join our new ZR Tabletop mailing list! In ‘main’ ZR news, we’re aiming to release our next Android update with Achievements in the coming 1-2 weeks, along with improvements to Training Plans and more! Next Post Try the 2015 Virtual Race for Free!